Editor’s Note: Jack Brittingham of Athens, Texas, has been an avid hunter all of his life. He has taken ducks all across North America, in Mexico and Alberta, Canada. In this article, Jack shares tips on using calls and decoys when duck hunting. Jack receives no compensation from the various outdoor products that he mentions, which allows him to be totally honest about choosing the products he likes best. As a kid, my family had a place about 45 miles from Little Rock, Arkansas. I grew up hunting flooded timber and rice fields. As I got older, I spent a lot of time hunting around the Dallas and the Fort Worth, Texas areas in river bottoms. I also went down to the Texas coast and Mexico for goose hunting. In the last 10 or 15 years, I’ve concentrated on the Texas coast because I have a ranch there. Also, I’ve spent a lot of time hunting in Culican and Los Mochis, Mexico as well as the west coast of Sinaloa, Mexico. I’ve also hunted both ducks and geese in the province of Alberta, Canada. My favorite duck to hunt is a toss-up between mallards and pintails. It has to do with the way they respond to a call. The mallards like flooded timber, which is one of my favorite types of hunting. If the conditions are more open, I like the pintail because of the way they fly, the way they decoy and the graceful nature of their flight. As a kid, my family had a guide who managed our land in Arkansas, and he was also an accomplished caller. I learned everything I could from him at about age 5. Over the course of my childhood, I raised a variety of ducks. Every morning and evening I would go down to the duck pens to listen and try to imitate the sounds I heard. Now, I use a call that’s manufactured in Stuttgart, Arkansas called Rich-N-Tone. When I’m hunting ducks in timber, I set my decoys out where the birds have been feeding and have been active. A good duck hunt will be scouted to find out what part of the timber the birds are using. Then you have to take into consideration the wind. You want to have an area that the birds can circle around the trees and then drop in to a site. You want to have the wind at your back so the birds are coming down in front of you. I’ll never use more than three dozen decoys. Depending on the size of the hole, you can get away with just putting out one dozen. Sometimes smaller numbers of decoys work better than larger numbers. Smaller decoy spreads typically are the most productive later in the season when the birds have been worked heavily. Sometimes putting out six or eight decoys is better, and then, kick the water to make the decoys appear real at the appropriate time. When you’re hunting in timber, use the bigger trees to break up your silhouette, and when the birds turn, kick the water to make ripples. This technique works well with only a few decoys. You have to read the birds and see how they’re responding to know which calls to make. There are days when you don’t want to do anything more than give a light feed call and a few short contented-duck calls. Then there are days when the birds are flying high and not wanting to work in, so, you have to use a hail call to get them to take a second look at your spread. The closer the ducks get, the less calling I do. A few clucks and quacks are sometimes better than making a lot of noise. One thing that’s important is having two or three guys working together to call. I think ducks can pick out when just one guy calls. When hunting in timber, I always use a 28 gauge or a 20 gauge gun. When you’re hunting in timber, a 12 gauge is too much gun. The birds are coming in and committing to your decoy spread and most shots are 25 yards or closer. I think a 12 gauge should be used in field hunting where shots tend to be longer. I like the Remington HEVI-SHOT. However, they don’t make that for a 28 gauge, so I shoot Bismuth pellets. Several of the Remington Sportsman Steel Loads for the 20 gauge are really good. For energy retention, I don’t shoot anything smaller than a No. 2 shot. 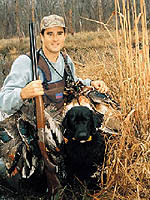 Hunting open-water ducks can be field hunting either a flooded rice field or cornfield. In Canada, it may be a cut wheat field or cut pea field. The birds are coming in to these locations primarily for feeding. The same scouting techniques apply as for timber hunting. You’re going to set up your blind and decoys to take advantage of the wind direction. Typically in the field I like to use a 12 gauge Benelli. I’ll use Remington 3-inch HEVI-SHOT or 3-1/2-inch HEVI-SHOT, depending on the conditions. For field hunting, I use more decoys than when I hunt in timber. I may use a combination of silhouettes, shells and full-bodied decoys for a decoy spread. They’re set out in groups of six to 10, imitating a pattern of feeding groups. The decoys will be set out with a hole left in the middle. Again, you want to have the wind at your back so when the birds circle around, they’ll be coming toward you. I’ll generally use 60 to 100 decoys when field hunting to imitate feeding patterns. Unlike in the timber, ducks will be in large groups in fields. I think a large spread gives the birds a bigger confidence factor when they begin to come in to light. I use a variety of decoys, including a few mechanical decoys for ducks that are unsure and I also use shells, full-body and silhouettes. Duck hunting in Mexico can be different from anything else you’ve experienced. 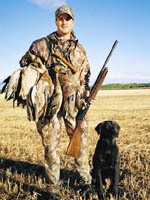 The hunting is generally done on large marshes located relatively close to the coast. These marshes are final wintering stops for migrating birds. These marshes hold 30,000 or 40,000 ducks. Bag limits in Mexico are more liberal than in the United States. It wouldn’t be uncommon to kill 12 or 15 birds in a day by Mexican law. You’ll also have a greater variety of ducks in Mexico. You do have to use decoys in Mexico, but they only put out 15 to 20 at the most. You’ll usually get dropped off by airboat and then they’ll come back about three or four hours later and pick you and the guide up. Typically green-winged teal are the most-common ducks taken in Mexico. Cinnamon teal, blue-winged teal, gadwalls and American wigeons are also very common. Depending on the time of year, mallards and pintails can also be numerous as well. Pre-scouting is the number-one mistake. A lot of hunters hunt without putting much effort into it. They don’t know where the birds are working and don’t put any thought into a plan. They’ll just go and throw out decoys in a place that looks ducky. I see it all the time, and I don’t understand why they aren’t scouting. Not using enough decoys in field hunting is another big mistake. Not being proficient with calling ducks limits your ability to be successful. Calls can be a great help, or they can be a deterrent, if not used properly. Many hunters don’t wear facemasks or face paint. A big mistake hunters make is moving too much in the blind or exposing themselves to the ducks. Ducks have great eyesight and that is often underestimated. Dogs should also have camouflage. A lot of guys don’t get to the blinds early enough to take advantage of the first 30 minutes of hunting. This time can be the most productive time of the day and can make or break your hunt. I’ve had shoots where I shot our limit in the first 30 minutes. If I hadn’t gotten there early enough, I probably wouldn’t have shot half of my limit.